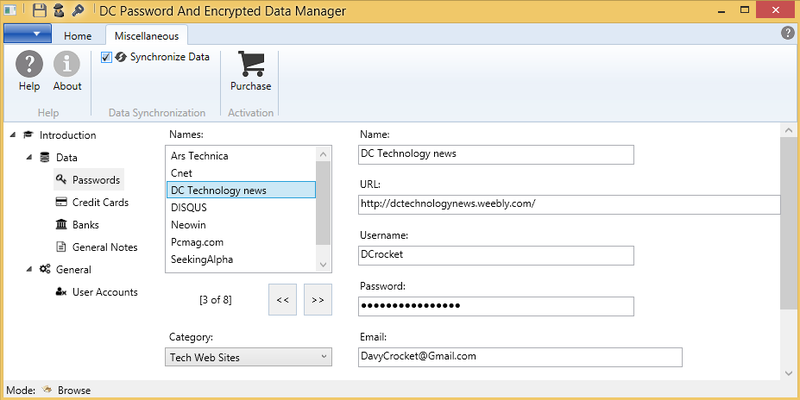 DC Password And Encrypted Data Manager Doc - Activating The Application - Douglas Computing, Inc. Please note: the steps outlined in this section of the tutorial, require the user have administrator privilege. Also, if you have urgent issues you are unable to resolve with this tutorial, please send email to support@douglascomputing.com for support. Whey you first begin using the DC Password And Encrypted Data Manager, it automatically becomes activated for a trial period of 14 days. After the trial period expires, you have to activate the application to continue using it permanently. You can also purchase and activate the application permanently at anytime, during the trial period, if you so chose. This section of the online tutorial, explains the process of permanently activating the DC Password And Encrypted Data Manager. After you have used the DC Password And Encrypted Data Manager for 14 or more days and you startup the application once more, you will be greeted by the following dialog box to activate the application for permanent use. To do so, you will have to purchase the application. To purchase the application, click on the Purchase button, and use the resulting web page to do so. At the end of the purchase process, you will be automatically sent emails, one of which will contain an activation code which you can use, to activate your application permanently. Copy and paste the activation code you received via email, into the Activation Code text box shown in the above dialog. Next, click on the OK button, to initiate phase 1 of the activation process. 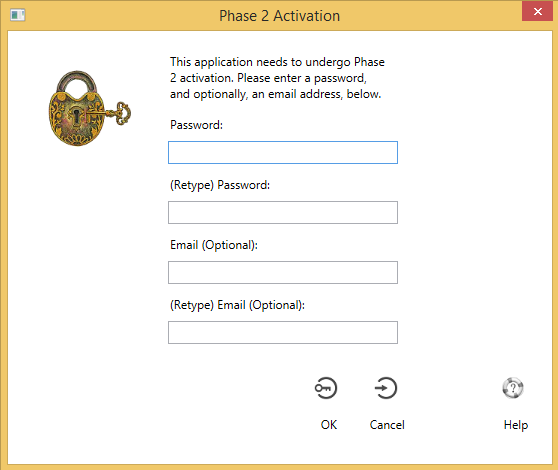 If you have never before tried to activate the DC Password And Encrypted Data Manager with the activation code you are using, you should see the above dialog, after you click on the OK button in the preceding dialog, to initiate phase 1 of the activation process. Type in a password, 1 - 16 characters long, made up of characters a-z, A-z, and / or 0-9. Next retype the password, and ENSURE THAT YOU NOTE IT FOR FUTURE REFERENCE. Also enter an email address, which can be used by the activation system, to send you your password, in the event you are unable to recall it. Next, re-enter your email, and click on the OK button, to initiate the final phase of activation. After you do the above, you should see the login screen for the DC Password And Encrypted Data Manager. If you would like to purchase the application during trial, and activate it permanently, click on the Miscellaneous tab on the ribbon bar for the DC Password And Encrypted Data Manager, then click on the purchase button on the ribbon bar. The above action should bring up the following dialog. See the section Activation On Ending Of Trial Period above, regarding how to purchase the application, and activate it. If after you have purchased the application and activated it, you find it necessary to re-install it on a PC, you will have reactivate it, to begin using it again. After you have re-installed the application, you should see the following dialog. Enter your activation code into the text box in the dialog, then click the OK button. 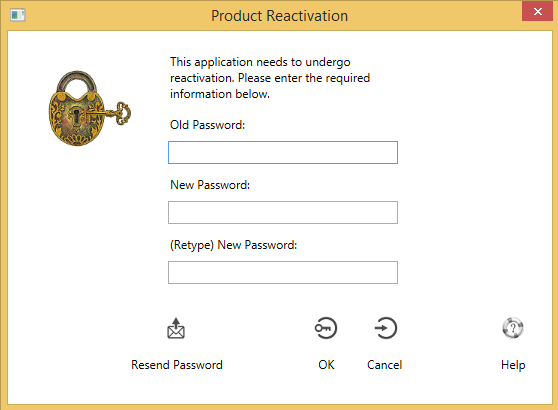 Enter the old password you used when you last activated the DC Password And Encrypted Data Manager, with the activation code you are using, then create a new password (1 - 16 characters long, made up of characters a-z, A-z, and / or 0-9) and enter it in the new password text boxes, in the Product Reactivation dialog. ENSURE THAT YOU NOTE YOUR NEW PASSWORD FOR FUTURE REFERENCE. If you are unable to recall your old password, click on the Resend Password button in the dialog, to have your old password sent to you via email automatically. 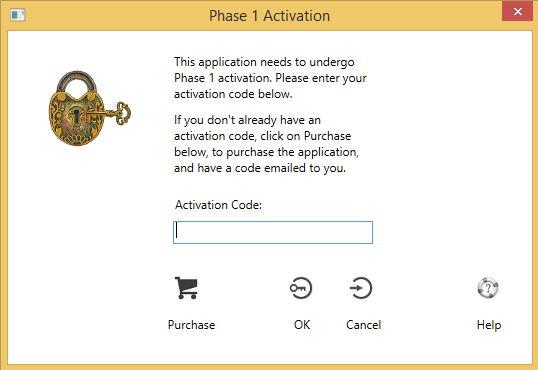 After you have appropriately filled out the text boxes in the Product Reactivation dialog, click on the OK button, to initiate the final phase of activation. After you do the above, you should see the initial login screen for the DC Password And Encrypted Data Manager.